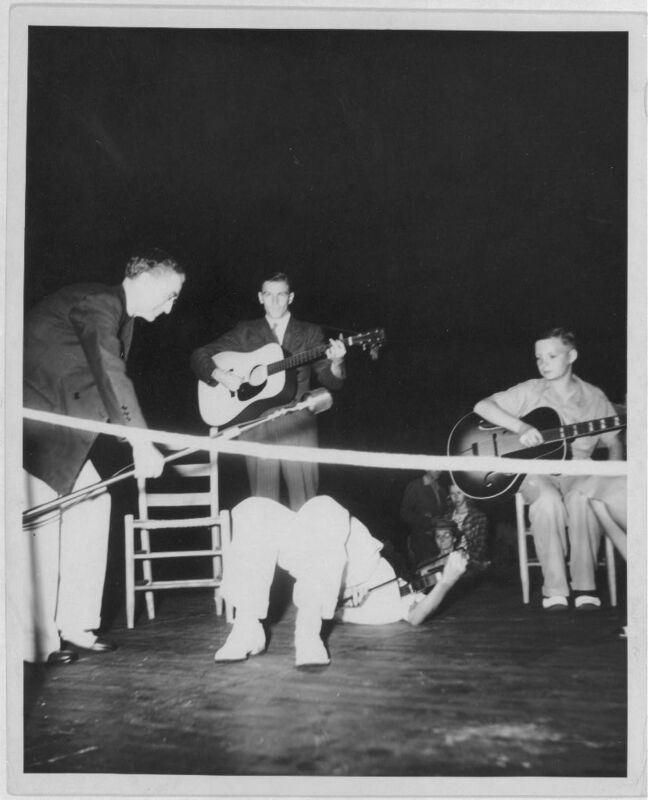 I have decided to dedicate my last blog post to Sister Rosetta Tharpe because she was mentioned in class the other day and she is just so very cool. She was born Rosetta Nubin and was a famous blues guitar player who would go on to become the first successful crossover acts who played both gospel and pop songs with a career spanning the 1940s and 50s.1 She started playing publicly in front of her church at the age of four but went on to pursue a career in the music industry, first as a gospel singer and then also as a popular singer. She was an incredibly talented singer and guitar player. She was one of the foremost talents on guitar and used to regularly challenge and subsequently beat male guitar players. She disrupted both the expectations of the musical genre (gospel) and her gender with her skill. She was so widely known that (as you can see in the review below) people would call her things like “the greatest individual personality in religious singing history”. This happens to be an announcement promoting an event she is headlining in Kansas but is not an advertisement so there is a greater likelihood that the feeling is true. 1.Sanjek, David. “Tharpe [née Nubin], Sister Rosetta.” Grove Music Online. 1 May. 2018.http://www.oxfordmusiconline.com/grovemusic/view/10.1093/gmo/9781561592630.001.0001/omo-9781561592630-e-1002258519. 2. Wald, Gayle. Shout, Sister, Shout! : The Untold Story of Rock-and-roll Trailblazer Sister Rosetta Tharpe. African American Music Reference. Boston: Beacon Press, 2007. 3. 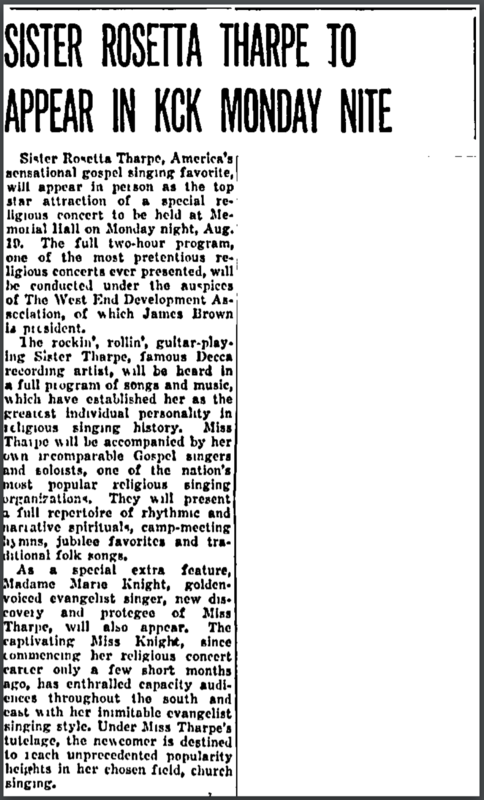 “Tharpe, Sister Rosetta, 1915-1973, by Jason Ankeny, All Music Guide.” In All Music Guide: The Definitive Guide to Popular Music, 1. San Francisco, CA: Backbeat Books, 2001.https://search.alexanderstreet.com/view/work/bibliographic_entity%7Cbiography%7C591347. 4. 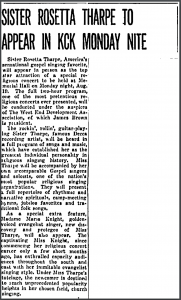 “Sister Rosetta Tharpe to Appear in KCK Monday Nite”. Plaindealer (Kansas City, KS), Aug. 16, 1946. Found in America’s Historical Newspapers. http://infoweb.newsbank.com/iw-search/we/HistArchive/?p_product=EANX&p_theme=ahnp&p_nbid=T5FM5BIVMTUyNTg5Nzc0NC42Nzk5NDk6MToxNDoxMzAuNzEuMjQxLjIwNA&p_action=doc&d_viewref=search&s_lastnonissuequeryname=2&p_queryname=2&p_docnum=32&p_docref=v2:12ACD7C7734164EC@EANX-12CFEEF4B0A35310@2432049-12CFEEF4D6E4C760@4-12CFEEF59D7F9ED8@Sister%20Rosetta%20Tharpe%20to%20Appear%20in%20KCK%20Monday%20Nite. In combing through the archives to find documents that would be valid proof for my blog post, the problem of preservation and what counts as music that should be highlighted as an authentic expression of what it means to be a black American in the late 1800s kept bothering me and continues to do so. We know that there are a number of songs that failed to be preserved and passed down that told the experience of slaves, perhaps in a way that we will never know as present day audiences, far removed from that experience ourselves. However, in thinking about all of this and in looking through the archive, a question arose: how would a song like the one below fit in? This so-called ‘Ethiopian Song’ was written as a minstrel song but it retains the same elements of a spiritual. Furthermore, it was written by a black composer Gussie Davis. 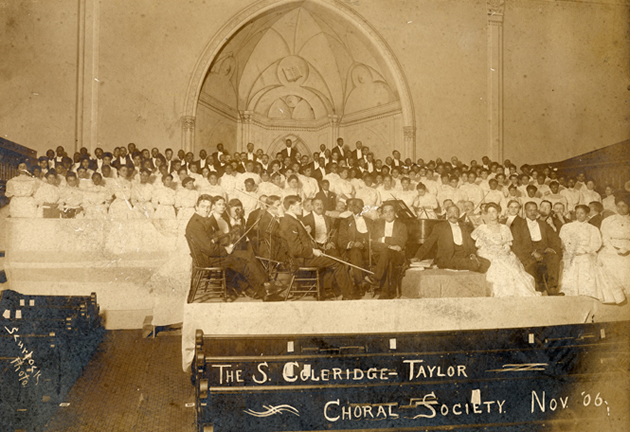 It arguably is at the very least inspired by the spirituals that were an established form of music by this time. Does this mean that it can be seen as a part of that tradition? The lyrics themselves are the puzzle. As one can probably deduce, the song is about someone climbing up to heaven. There are multiple references to biblical objects like New Jerusalem and Satan which were also common in spirituals. Would it then fit the criteria of a spiritual? Does this change the perspective we have about “Clime up de ladder to de clouds”? 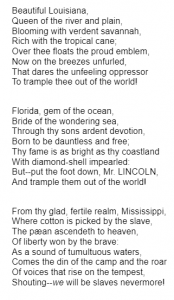 What about when we learn that Gussie Davis (who composed the song) grew up in Ohio and never experienced slavery?4 No I could not find a source for this, but would things be viewed differently if we found out that his parents had been former slaves? Or that he could directly point to a spiritual that had inspired this song? Even though we may not agree that despite all of this, this song still does not have a place in the the spiritual tradition, it is still important to think about the questions this example raises. How do we understand what makes a black spiritual? Who gets to make it up? Does direct influence of spirituals or experience have to be explicitly affirmed or can we find other ways to hint at it? What would it mean if we included minstrel songs into the spiritual repertoire? I don’t know if there are answers to those questions but they are worth thinking about. 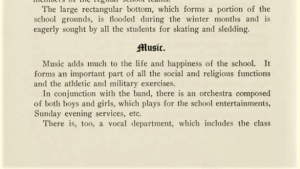 1.Epstein, Dena J. Sinful Tunes and Spirituals : Black Folk Music to the Civil War. 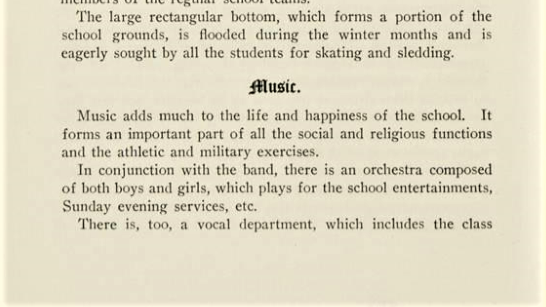 Music in American Life. Urbana: University of Illinois Press, 1977. 3. Southern, E. (1971). “Entertainment for the Masters” inThe music of black Americans : A history. (1st ed. ), 173-175. New York: W. W. Norton. 4. Saffle, Michael. “Davis, Gussie Lord.” International Dictionary of Black Composers, Vol. 1: Abrams-Jenkins. 374-78. https://search.alexanderstreet.com/view/work/bibliographic_entity%7Creference_article%7C1000081424. In trying to come up with this blog post, I decided to take my inspiration for a research topic from the readings for class about the legacy of minstrel shows. The one I found the most striking and complex was a popular radio show (and short lived TV show) called Amos ‘n Andy. Written and performed by two white actors, Amos ‘n’ Andy started as a regional Chicago radio show named Sam ‘n’ Henry. Within a few years and a name change the show was broadcasted nationally and eventually became the most popular show of its kind. Other shows were called Burnt Cork Review, Aunt Jemima and Plantation Party. 2 which should give a hint to the idea that these shows were the offspring of the minstrel tradition. All told, the radio show ran in some form (nightly or weekly) for a total of 32 years from 1928 to 1960. There were a number of other plays and even at least one movie that I found inspired by those characters along with a number of commercial items like toys and buttons. Amos ‘n’ Andy relied on the humor and formula that had worked in the not-so-distant past in minstrel shows. It was a direct legacy of minstrel shows in more ways than one. It was an immensely popular show that ran for years, even through the Great Depression. In fact, the two actors on the show were two of the highest people paid in the years of the Depression. The clearest example of the legacy of minstrelsy in the show was the way humor was manufactured: the actors used dialect and slapstick comedy for laughs, the two main characters were two forms of the stereotypical characters that had appeared on so many minstrel shows. They were both naive bumpkins who were prone to mishaps and general buffoonery. Amos ‘n Andy was a good example of the legacy minstrelsy has left behind in this country. It also reflected the shifting dynamics of the country because of the way the NAACP was able to successfully protest against the TV show and get the network to cancel it. Yet, while the TV show was protested against and cancelled, the radio show continued to play in the background. The ambiguity of the minstrel show is left behind too because like you can see in the picture at the top, the actors would appear in blackface as their characters like the minstrel shows but would later go on to comment that they felt their show did not a negative depictions of African Americans. Not to mention the fact that the show was an extremely popular American phenomenon demonstrating the enduring appeal of the minstrel shows even though the format of the it changed. 2 Dobson, Frank E. “Amos ’n’ Andy.” In Encyclopedia of African American History 1896 to the Present. : Oxford University Press, 2009. http://www.oxfordreference.com/view/10.1093/acref/9780195167795.001.0001/acref-9780195167795-e-0056. 3 Johnson, Stephen, ed. Burnt Cork: Traditions and Legacies of Blackface Minstrelsy. University of Massachusetts Press, 2012. http://www.jstor.org/stable/j.ctt5vk2wm. 4 Young, William H. “Amos ‘N’ Andy (Radio and Tv, 1928).” In The American Mosaic: The African American Experience, ABC-CLIO, 2018. Accessed March 8, 2018. https://africanamerican2.abc-clio.com/Search/Display/1483015. BITHCERSHowever, what I found out while doing my research for this post is that the roots of this musical tradition can be traced back to the the US Civil War and the songs of the Confederate South. The two themes are prominent within it: a denial of black experience in the American South and this rural lifestyle as an idyllic lifestyle that is lost anywhere else. This song is only one example of many in a book of war songs but each follows this theme of a lost ideal society that was being faced with tyranny from the North. 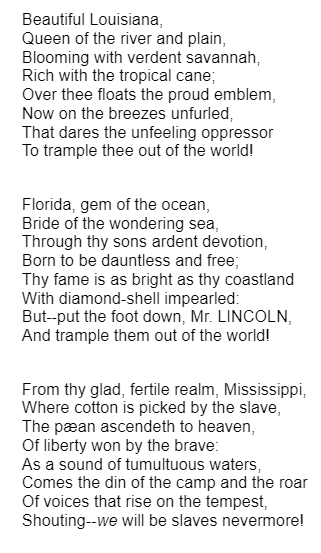 This song explicitly mentions slavery but alongside the beautiful natural conception of the South, ignoring the lives of a majority of people in that society! That idealization of the South implicitly glosses over major problems in that society. If we understand the war songs of the Confederate South as such, It makes sense that they were the foundation for a future of denying African Americans a role in the creation of country music. The song above is one example of a history of erasing black contributions to the society they find themselves in. Such an understanding of the pre-war South set the stage for the future conception of a rural lifestyle idealized even today in country music.Songs today in the genre revolve around the same ideas like trucks and tractors and lost love. Although in our time not explicitly negating the experience of African Americans in that rural lifestyle, it is built on a tradition in the genre of idealizing a lifestyle while simultaneously ignoring different lifestyles of many people within it. 2 Nunn, Erich. “COUNTRY MUSIC AND THE SOULS OF WHITE FOLK.” Criticism 51, no. 4 (2009): 623-49. http://www.jstor.org/stable/23131534. 3 . “Lines to the Tyrant”. Page 30-34. In War Songs of the South. Edited by “Bohemian,” Correspondent Richmond Dispatch. Richmond:West & Johnston, 145 Main Street.1862.